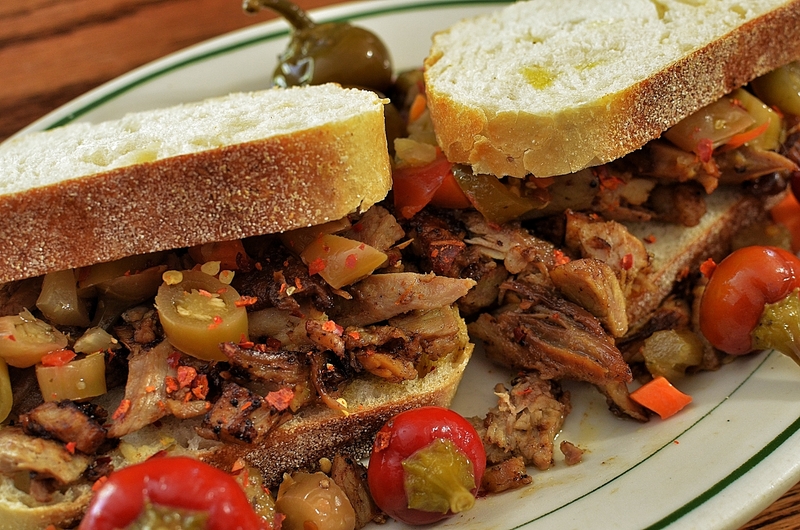 Rather than add the giardiniera as a topping, this time it was added to the pork as it heated in the saute pan. The buns are from the Kroger deli bakery and are quite small. They could hold a standard sized hot dog but are on the small side even for hot dog buns. My dough shaping still needs a lot of work. This one is long and skinny. It would make a fair foot long hotdog bun. 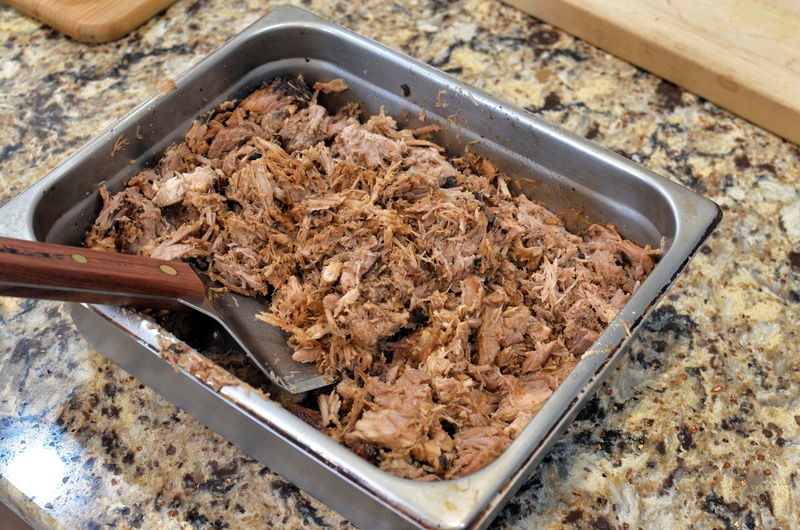 I made it work with roasted and chopped pork today and it does manage the task in a workman like manner but without the élan I hoped for. 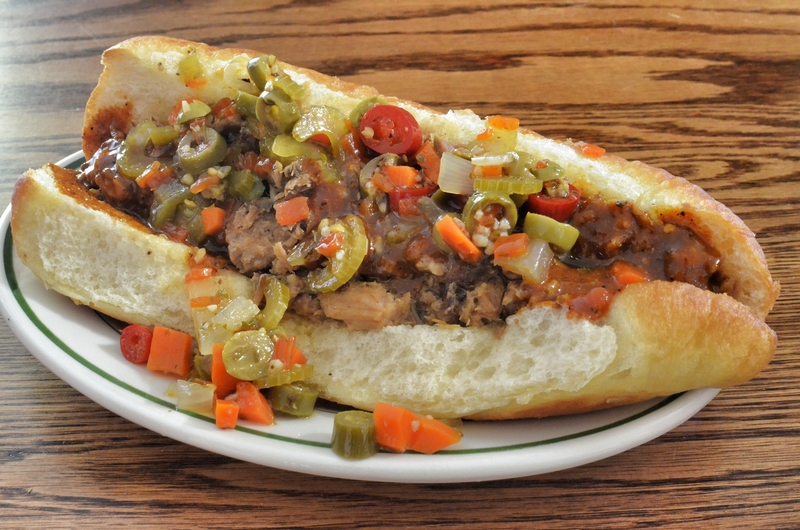 It has a sweet habanero sauce and a nice garnish of hot giardiniera. 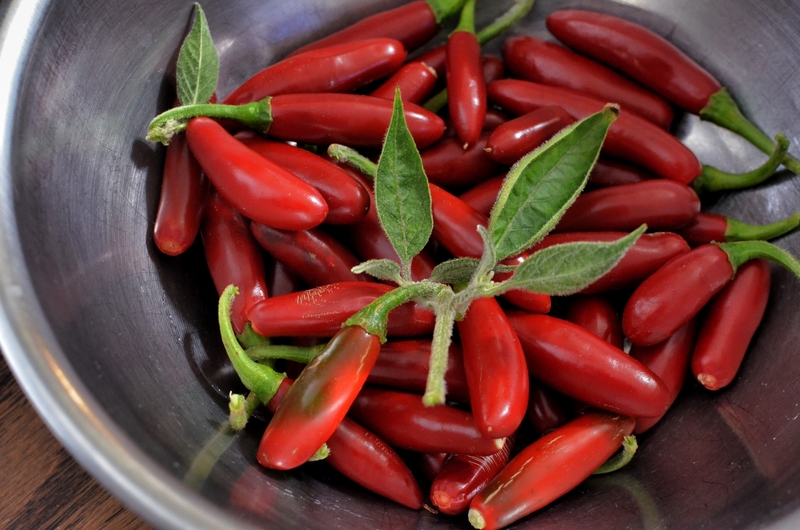 My serrano pepper plant was producing a fair crop of peppers, they were ripening and some were past ripe and starting to dry out. I picked all the ripe ones with a vague idea that I would dry them, or something. 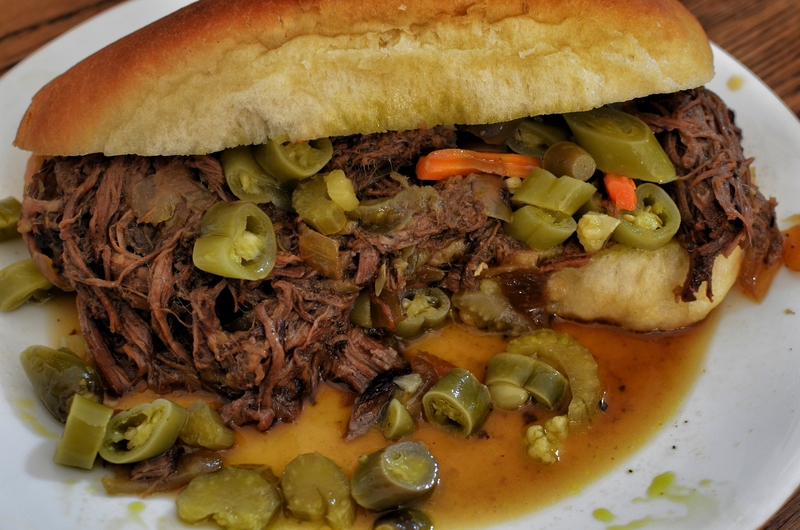 Inspiration struck as I was spooning hot Chicago style giardiniera over yesterday’s Italian beef. 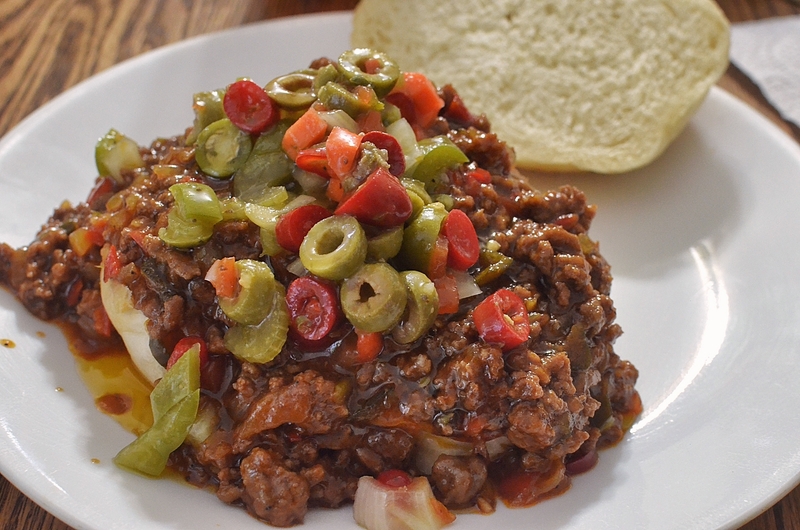 Look at all those little pepper chunks! Those are serranos, still green, as you will almost always see them. Our giardiniera selection is limited at this end of the state, there may be one variety of it on the shelves if we’re lucky. My local Kroger doesn’t carry any, unlike Chicago area stores. Fortunately, there are tons of recipes on line. 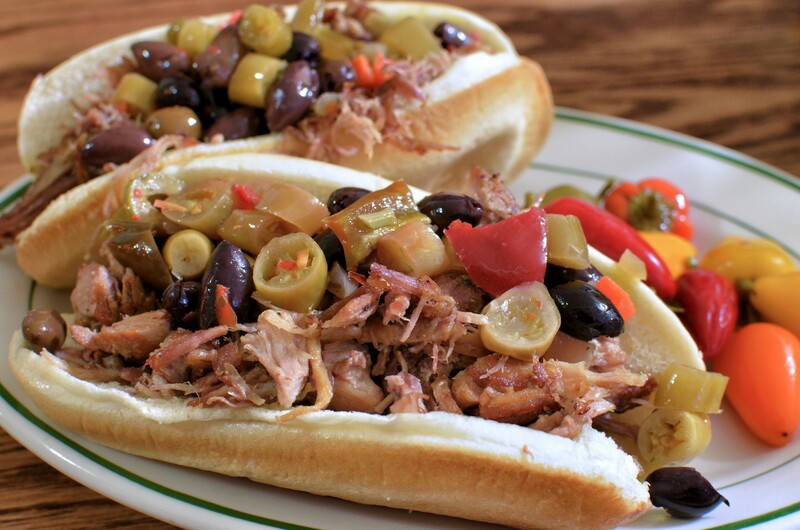 There are plenty of variations – this version has ripe and green serranos, green bell peppers, carrots, celery, onions, olive oil, white vinegar, dried oregano, black pepper, garlic, celery seed, and a 5 oz. jar of chopped green salad olives with pimentos. To prepare it, stir a half cup of salt into the raw veggies, add water to cover, and refrigerate overnight. The next day rinse thoroughly to get rid of the salt, then add equal measures of vinegar and olive oil, stir in the garlic, the drained olives, and other seasonings. I hesitate to list quantities, for this batch I used 1 cup each of vinegar and oil, a couple tablespoons of minced garlic, and just eyeballed the rest. This will store in the fridge so I won’t try to process it further for stable shelf storage. 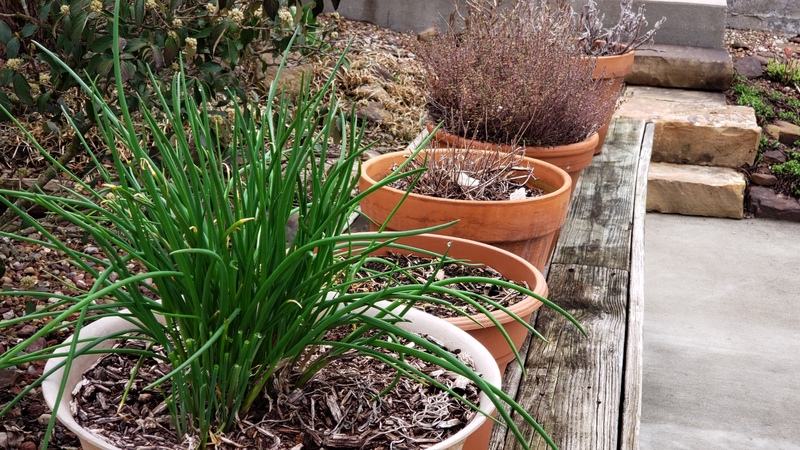 I bet these will be pretty hot – I’ll let you know after they spend a few days coming together. 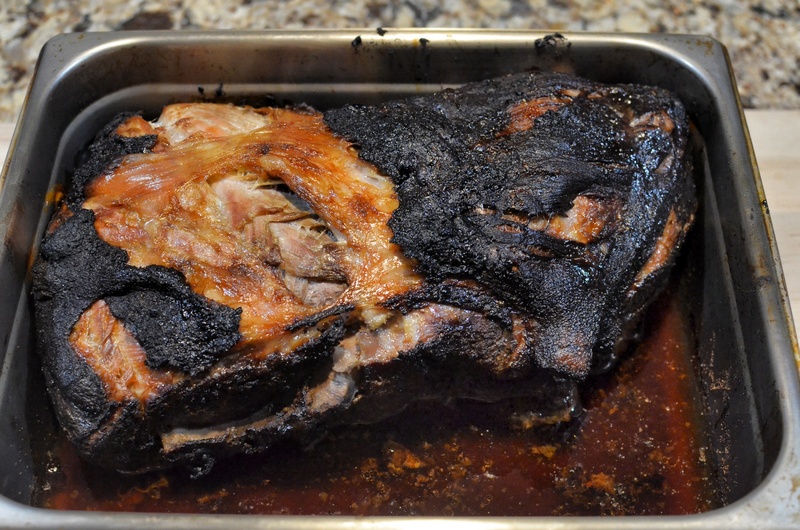 We thawed that pork shoulder overnight and browned it on all sides in a big pot this morning after poking it full of garlic cloves. I bet I stuck a dozen and a half of them in there. Can’t have too much garlic. I added a quart or so of chicken stock and a couple of onions, some oregano, pepper and salt and put it, covered, into a 350 oven for three hours or so. The meat was falling apart tender. I cooled it and pulled the meat apart for the sammiches. 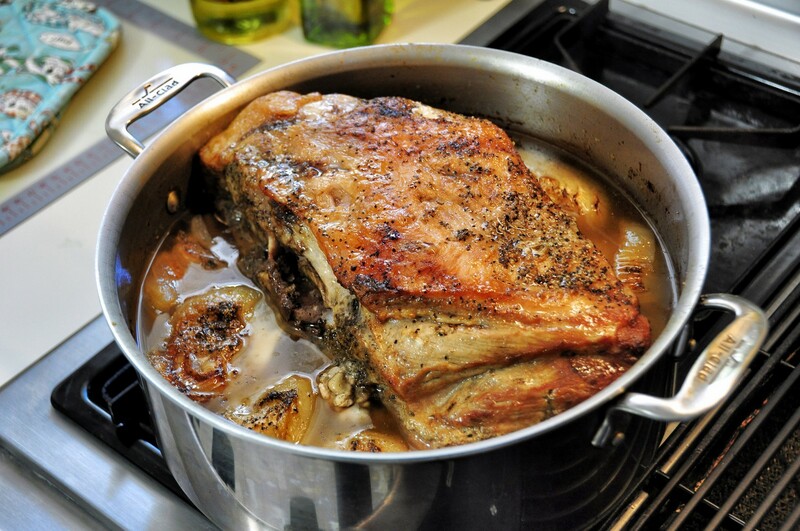 Reheat the pork in a pan with oil to brown and crisp it some. 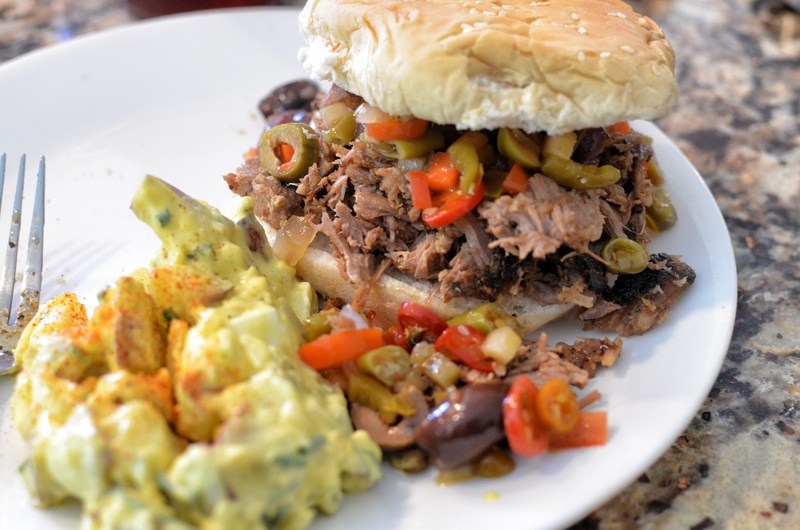 Mrs J has hers with Sweet Baby Ray’s bbq sauce, I top mine with hot giardiniera that I’ve fortified with some baby kalamatas. 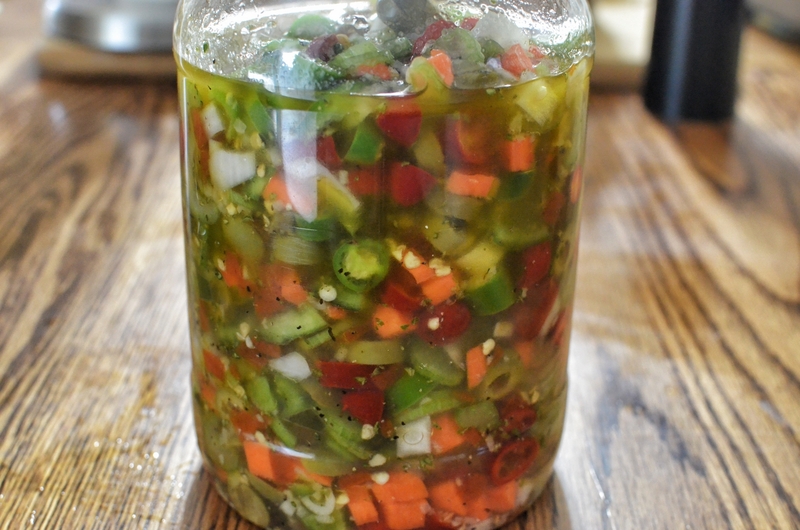 …with the hot giardiniera and a few of last year’s cherry peppers. I’m sorry I didn’t grow any this year these are so good. I do have a lot of them and Mrs J will not try them so It will be up to me to finish them off. Just like the giardiniera.